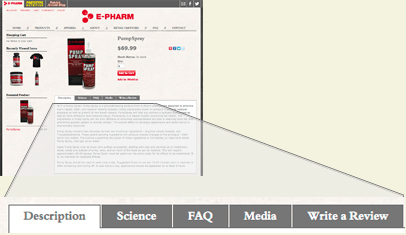 Project Description: E-Pharm approached Six Demon Studio with a simple request, they needed an update to the website we had previously put in place for them. This update had to be ecommerce capable, have a robust CMS that a allowed for a vast amount of information to be presented on each product in an organized manner and it needed to be able to be the corner stone of the brands new marketing direction. This new marketing direction started by taking the old website and throwing everything out and starting completely from scratch. The new design was meant to be rough and aggressive while providing customers easy navigation and strong callouts. Keeping with E-Pharm’s signature deep red coloring, a dark and heavily textured with the signature color serving as the focus point. The solution to the amount of information needed to present to the customer regarding the product was solved with a tabbed style item information layout. This layout is completely driven by the CMS and implemented in the back end of the website in a way that would make it easy for the client to update, add or change the copy on their own if they desired. The result of the project was a resounding success and helped launch E-Pharm’s new marketing direction which included updated promotion pieces and a packaging redesign.